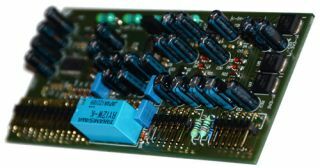 Heed DAC Card v2.1 brings upgrades to Obelisk range | What Hi-Fi? The Heed Audio Obelisk range, which includes the Award-winning Heed Obelisk si integrated amplifier, has gained a new digital to analogue converter with the arrival of the Heed DAC Card v2.1. Available either fitted in the Obelisk da DAC at £1500 – the standard da is £1300, and will continue to be sold – or as a £450 upgrade for the Obelisk pre or existing owners of the da, the new card brings 192kHz/24-bit capability to the range courtesy of Woldson's WM8741 DAC chipset. This also allows the choice of three selectable digital filter settings, adjusting the high frequency roll-off curve to tailor the sound to the equipment with which the product will be used and the user's room acoustics. Filtering is set via board-mounter jumpers, and offers the choice of ‘linear phase soft knee’, ‘linear phase brickwall’ and ‘minimum phase soft knee’ roll-offs. The new HEED DAC Card v2.1 is available now.